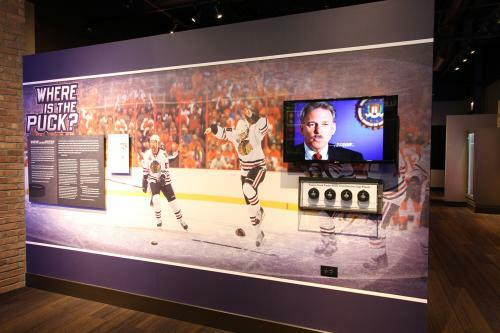 Begin your tour of Chicago sports history with a chance to test your skills against some of the all-time greats. Learn to throw a curveball from Cy Young Award Winner Steve Stone, test your vertical leap against Michael Jordan, compare your wingspan to Scottie Pippen and test your grip strength compared to Kyle Long. Around the corner you’ll find cases full of game worn memorabilia and championship rings. Remember Bears great William “Refrigerator” Perry? Try on a replica of his Super Bowl ring, the largest one ever crafted. Sleuth it up in Forensics using CSI-type technology to unravel some of Chicago’s most infamous sports mysteries. 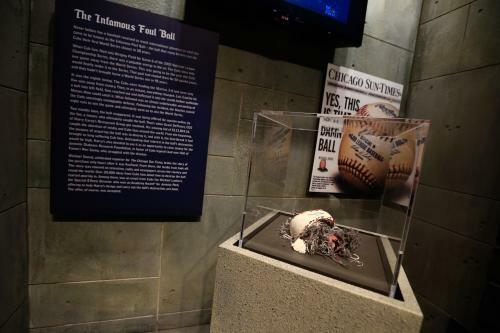 Examine a CT scan of Sammy Sosa’s corked bat, study cross-sections of baseballs to see how their construction has evolved over the last century and explore the work of FBI agents, radiologists, chemists and other forensics specialists as it relates to Chicago sports. 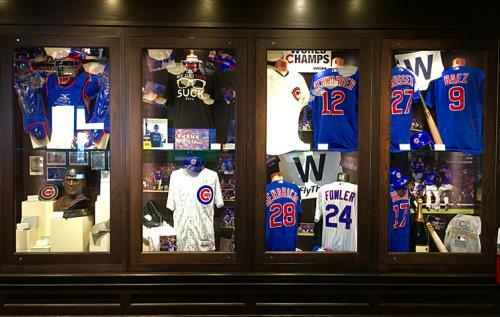 It’s only fitting that the center of the museum be dedicated to the greatest fans in the world – Chicago sports fans! 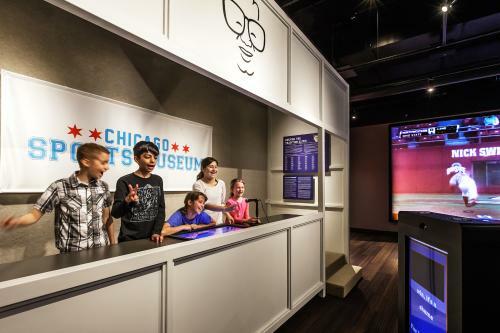 Step into the replica broadcast booth and take a chance at calling a game like the greatest Chicago baseball fan who ever lived: Harry Caray. You can even send home a video of your skills! Looking for something a little more intense? Hop into our professional simulator that puts YOU in the driver’s seat of a high-octane racecar at the famous Chicago Speedway. The most recent addition to the Fan Zone is perhaps the most exciting: the basketball hoop from Michael Jordan’s buzzer-beating shot in the 1998 NBA Finals! When you’re a team plagued by a 108 year World Series drought, superstitions become a way of life. Learn about curses that have beleaguered teams around the world and superstitions that players use to ward off “bad luck.” Immerse yourself in the world of Cubs lore and legends, from the remains of the Infamous Foul Ball from the 2003 playoff run to the Sports Almanac and Hoverboard from “Back to the Future II” which predicted the Cubs would win the World Series. 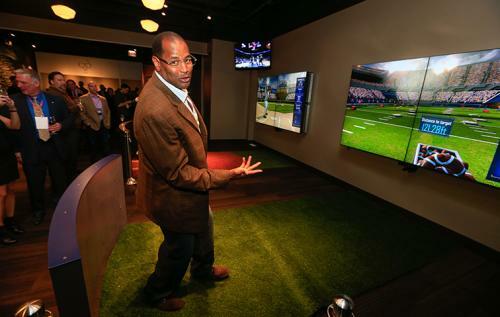 This area of the Museum features a collection of high tech virtual reality games that allow you to go head to head with Chicago’s greatest legends of all time. All Star Home Run Contest – Step into All-Star Hall of Famer Frank Thomas’ shoes and knock one out of the park! Quarterback Challenge – Think you can get one past Bears Hall of Famer and Super Bowl MVP Richard Dent? Aim for the targets down field before you get sacked! Shooting Hoops – Race against the clock with Bulls star Scottie Pippen as you aim to rack up as many points as possible before time runs out! Defending the Goal – He’s the greatest offensive player in recent history. Think you can defend the goal against Patrick Kane? Hockey Shooting Challenge – You better practice your best slap shot, because Chicago Wolves hockey legend Wendell “Ringmaster” Young is ready to take the heat! Chicago Sports Trivia – Take a breather and challenge your friends to a game of Chicago sports trivia. Which team did the Cubs beat in the 1908 World Series? Who scored six touchdowns against the 49ers in 1965? In what season were the Blackhawks founded? From common knowledge to obscure, this game is sure to entertain any level of fan! 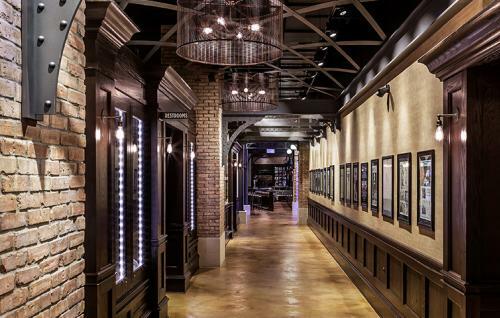 Take a step back in time and view newspaper headlines from Chicago’s biggest moments in sports, from Harry Caray’s Broadcasting career to World Series Championships, Stanley Cups, Super Bowls and more!